Mitwirkung im Buch “Street Art Köln”. Das spannende an der Arbeit im Feld der Graffiti Szene sind ganz klar auch die Mitwirkungsmöglichkeiten, die gemachten Erfahrungen in den unterschiedlichen Handlungsfeldern/Bereichen zu publizieren und diese dann in Buchform in den eigenen Händen halten zu können. Dieses mal haben die KollegInnen und ich aus dem Graffiti Projekt “MittwochsMaler” der Kunstagentin einige Fragen zu unseren Werken im öffentlichen Raum beantwortet. Auszüge davon finden sich im Buch “Street Art in Köln” das am 15. 5.2014 im Kiwi Verlag erscheinen wird. Details dazu in Bälde! Weitere spannende Beiträge in diesem Buch finden sich u.a. von Dr. Johannes Stahl, Dr. Sascha Schierz, Niels Müller, Akim Walta etc. Die “Internationalen Topsprayer” und Identitäsjonglierer aka Moses und Taps aka Ernie und Bert aka Germanys next Topsprayer, sind ab dem 01.02.13 mit einer Ausstellung in der Ruttkowski Galerie vertreten. Nachdem ich das Buch “Taps Moses International Topsprayer(2011) schon abgefeiert habe, bin ich sehr gespannt wie eine Umsetzung auf Gallerieebene funktionieren soll. Whether graffiti is described as scribbling, art, vandalism, or urban propaganda, it has long hovered between unlawful and lawful expression. Today, the gap between the two has narrowed. While street graffiti remains a form of vandalism, it is increasingly considered an art form, too. Some of those notorious paint sprayers are now defined as graffiti artists, whose works are exhibited, traded, collected, and analyzed. Graffiti has become a key influence in the world of contemporary art. One group, known variously as MOSES & TAPS™, ERNI & BERT™, and TOPSPRAYER™, has grabbed the attention of both law enforcement officials and art critics. The ever-changing name of this collective is not borne out of indecision or marketing. Rather, it helps conceal the identities of its members while still defying the unwritten laws of graffiti: anonymity. The pseudonym is the signature that gives the work recognition value – for fans and for the police as well. In 2011, the collective, who rigorously decided against an online presence, published a volume of their works for the first time. Across 288 pages, INTERNATIONAL TOPSPRAYER: MOSES & TAPS™ is a showcase of the group’s ambition to take graffiti to another level. Over the course of 1000 days, they spray-painted 1000 railway carriages. Some looked like typical graffiti, others were more conceptual. One work involved painting false doors and windows on a wagon, a trompe l’oeil effect that led to great confusion on the platform the next morning. On another carriage, the artists took a more ironically playful approach. They spray-painted a sign like those issued by German railway authorities, which warn that the train’s surface is protected by anti-graffiti coating. 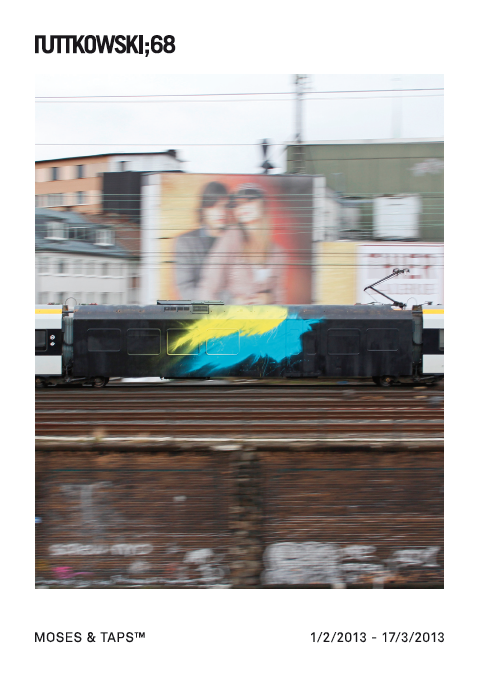 TOPSPRAYER EXPRESS™ opens on February 1st, 2013 at Ruttkowski;68 gallery in Cologne, Germany. It is the first solo exhibition by the artists. As the title implicates, the artists give graffiti a ride that is bound to a new direction. The works on show, re-interpret and transfer graffiti from its convential medium to another surrounding. The artist collective will remain incognito and won’t be present at any time.